A super king air plane landed on the Southern Highway on November tenth, 2010. It resulted in the largest drug bust ever in the history of Belize. According to the security forces, the plane has been locked away at the B.D.F. air wing. However, a report from Venezuela shows that an identical plane with the same registration markings has been busted over the past weekend in Caracas with another large shipment of cocaine. After News Five spoke to Javier Caceres of Notiven, Venezuela; a report on the planes was provided with documents courtesy of Globovision and video courtesy of VTV, Venezuela. It has been translated so you, the viewer can decide if it’s just a coincidence or the same plane. Mr. Pm their been many rumor about this particular plane. Can 2 plane has the same identity? Yes. by fraudulent paper work. So as to clear up this matter, about the plan. Mr. Pm one of your top military officers said that it is still in the hand of BDF and the present GOV have not sold off the plane, So let the media view the plan where it sit at this moment. To put we belizean mind at peace. We have too many problem under this PM, and its time to stop. Please don’t let it be another black eye for us Mr. PM. we cannot turn our little country into a dictatorship. This is a good one. 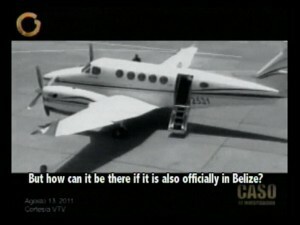 I guess the media and the people of Belize need to see the plane held by the BDF. That will clarify all doubts .I don’t put it pass the gov. to have engaged in corruption again. We have to remember…….. that is what they do.To all IDIOTS in Belize…….wake up!! Wake u!! The country is going down the tubes. Do nothing now and suffer later. when will we as belizean rise up aganist these crooks and murders we call the government and the police. instead of fighting aganist and killing our neighbors . there is not one belizean i know that have anything to say positive about the crooks and killers. we need to stop buy into politricks, and wise up and see whats going on. 98% of belizean dont even have ten thousand save for hard time. Yes we need to see some evidence that this plane is in the hands of the BDF.Too much $#*% the pass by with out no kinda a explanation n we just sit and mek eh go right through i think dah time fi start to get some answers and who responsible fi any wrong doing suffer the consequnces. show us the plane Mr BDF.! !